The NAUFRP annual General Assembly will meet October 3, 2018 at the Oregon Convention Center, Room B119, in Portland, OR. The meeting will begin at 8:00 am preceded by a continental breakfast. Find the Agenda here Review the draft 2017 General Assembly minutes here. 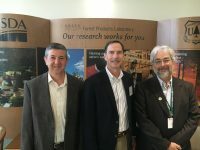 2017-2018 NAUFRP Officers Jim Allen, Past President (Northern Arizona University); Keith Belli, President (University of Tennessee); David Newman, President-Elect (SUNY).